My day started out horribly. I was slammed with work that just didn't seem to go anywhere and I was in no mood to socialize during lunch. But I set up a lunch date a while ago at 8st Kitchen with my co-workers, and didn't want to cancel last minute. In the end, I couldn't be happier about my decision to go - not only did I get to try Korean cuisine for the first time, my mood completely transformed as a result of it. As a brand spankin' newcomer, 8st Kitchen has that "untouched" feel. The decor is ultra modern with dark wood rectangular tables and bench seating that isn't the most comfortable but not unpleasant either. I like the simple, round light fixtures with exposed light bulbs, as well as the awesome wall filled with rustic pieces of cedar wood. It even smells new! The vibe is chill and pretty quiet for lunch. We were the first customers to arrive, but after a few minutes, we had some company a few tables down. So, what I'm saying is...you definitely won't need a reservation. 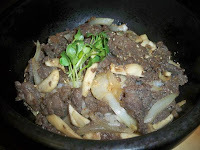 Leann and I were both unfamiliar with Korean cuisine, so we looked to our friend Bo for recommendations. Bo is Korean and grew up eating this food, so she had good pointers. Although there was some confusion when ordering--Bo had to address it by using her multi-lingual skills--in the end it worked out for the best and we were happy with our choices. Starters - The beginnings of our lunch consisted of a modest yet appreciated offering of clear soup with sprouts as well as two small appetizer plates of daikon and kimchee . I've never had any of these dishes and was intrigued to try them. The soup was my favorite, as it was warm in temperature and in spice. It wasn't too spicy but had a defnite kick to it that lingered on your tastebuds. 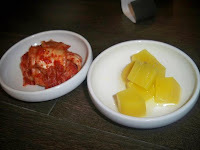 The Kimchee and the daikon, both pickled dishes were also interesting. The daikon looked strangely like pineapple chunks but tasted tangy and a bit sour. I enjoyed it as a starter, and it certainly cooled your mouth after the hot soup. After tasting the kimchee, Bo thought it would be a culture shock. Hmmm...I was curious as I popped a small piece in my mouth. It was spicy, smoky and crunchy too - overall a hit for me, especially since I'm a huge cabbage lover. I'd certainly recommend trying it just to experience the mix of flavors. 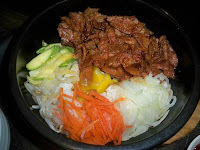 Dol Sot Bi Bim Bap - We all ordered this typical Korean dish, which consists of steamed sticky rice served in a hot stone bowl topped with a protein. Each of us got a different variation of the latter: Leann chose the spicy chicken, Bo got the spicy pork and I went with the marinated beef (bulgoki). Really not knowing what to expect, I was impressed when all the dishes came out in beautiful stone bowls, some of which contained contents that were literally bubbling up with goodness. Each of our dishes looked amazing and we couldn't wait to dig in. My beef was AWESOME and I'm so glad I chose it - it was tender with a hint of sweetness that hit your tastebuds a couple of seconds after the fact. The best part though was the sticky rice, which was so flavorful (I know that sounds weird to say about rice but it's true). Because the stone bowl was so hot, the rice got slightly crispy on the outside and was a little charred. It all worked beautifully when combining it with the delicious beef and also mixing in a couple of spoonfuls of hot sauce. I tried both the chicken and the pork but couldn't decide which I liked better. I'm going to have to make two separate trips to order each just for myself. 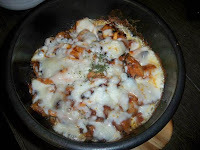 If picking a slight favorite, I'd choose the chicken, which had loads of cheese on top, and when mixed with the rice, it was oozing with stringy goodness. Just like in my dish, the chicken was affected by the hot stone bowl and got nice and charred on the edges. The pork was great too and definitely the spiciest of the three. It came with vegetables and a raw egg, which Bo mixed into the rest of its contents, thus cooking it. This dish looked the most authentic out of the three and if you're a pork gal or guy, you'll love it. Service began on a strange note with a slight language barrier between us and the waiter. However after we ordered, everything went smoothly. Our waiter was attentive, respectful and brought out all dishes promptly. As an added bonus, we each received coupons for a free lunch for next time. That's right, it's buy one get one free lunch until the end of February. Because of 8st Kitchen's friendly staff coupled with our nifty negotiating skills, we were able to get 1 lunch for free, so we ended up paying for two dishes and split the cost amongst the three of us. Each dish was a mere $8 without the discount - and with discount it was $8 per person including tax and tip (we left our server a generous tip in exchange for his kindness). For the amount of food you get here and for how tasty it is, this is an absolute steal. I'm glad you enjoyed your experience, it's always fun trying new things! Thanks for the pointers Jennifer - I'm clearly not an expert in this cuisine, but I hope to have more of it very soon! I need to go back for my free lunch after all. Haha, sorry I get excited when people talk about Korean food because it actually something I know a little bit about! Kimberlah - we'll definitely have to go when you come back to the city.